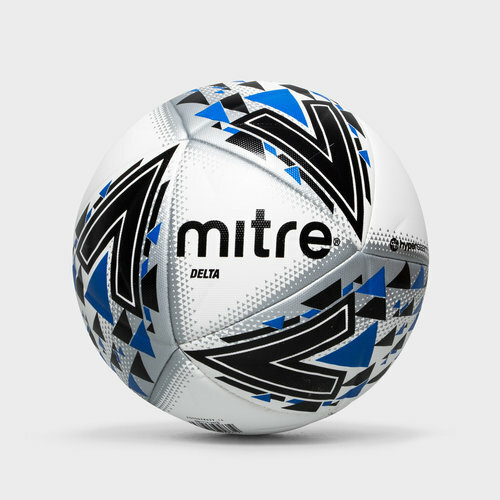 Show off the skills you perfected in training during a competitive match when you use this Mitre Delta Professional Match Football in a White, Black and Blue colourway. This match football from British sportswear and equipment manufacturer Mitre is a top-level training ball. Coming from a company that is the world's oldest sports manufacturer means the ball alongside any sporting goods has been crafted from experience. Existing for over 200 years means Mitre know what it takes to produce excellent equipment over and over. This ball is mitre's base-level professional ball and has been stamped with the FIFA Pro Quality accreditation mark. It has been crafted with a unique 14-panel configuration for consistent energy and power transfer from boot to ball for incredible speed. The exclusive embossed surface manipulates airflow around the ball for pin-point accuracy and superior speed whilst the 4.5 mm hyperfoam converts power into pure kinetic energy for boosted speed. The ball has been designed with a 1.2mm Japanese PU outer material which was made for an improved feel, durability and power whilst being environmentally friendly. It's been developed with a laminated power bladder that ensures the ball shape and flight remain true - whilst ensuring added power to help guide shots straight into the top corner. The football is engineered with revolutionary Hyperseam technology for almost zero water uptake, helping the ball last in any weather.